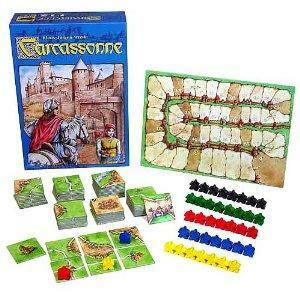 Carcassonne is a German board game that uses tiles to construct a French landscape. First published in 2000, the game is available in English and German but is played around the world. If you are looking for a quick game to introduce children to board games, then Carcassonne is a good option. It's easy enough for kids to play, and has enough luck and stategy associated with it to be enjoyable for adults too. 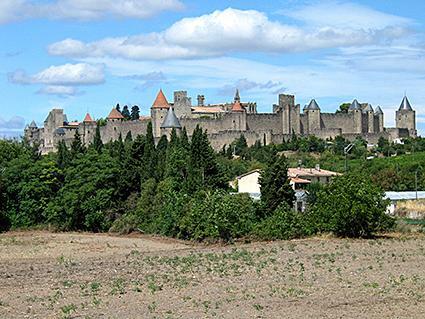 This game takes place in medieval times and is based around the town of Carcassonne. The town is situated in the southern part of France. What made it an interesting basis for a game is that the town is surrounded by walls, which leads to self-sufficient farming, schooling, and general interactions. The game pieces, which are made to resemble people, are called meeples and are a common icon in Europe. Carcassonne is a mix of luck and strategy. You draw one landscape tile each turn and add it to the other tiles on the table, creating a map of the Carcassonne. You can't control which tile you play -- that's the luck element -- but through good strategy you can put your tiles in the places where they will score the most points. Carcassone is available in many hobby game stores and some mass-market stores, or you can puchase it at Target and Barnes and Noble online. The game and all of the expansion packs are also available at Amazon. Players start with a plain board representing the landscape. One terrain tile is facing up. The rest of the 71 tiles are shuffled and placed face down, which becomes the draw pile. When it's a player's turn, he or she will take a tile from the draw pile and place it next to other tiles already existing on the board. Each tile contains different terrain features like roads, fields and cities. When a player lays a tile down, it must connect similar features. For example, a road tile must match the adjacent road tile in terms of expanding the road. After a tile has been laid, the player then has a choice of setting a "follower" on that tile. If a player chooses to do so, this follower claims that tile feature, or owns it. Features can be shared if two followers sit on tiles next to each other. After the last tile has been set on the gameboard, Carcassonne ends, and scores are tallied. Almost everything in Carcassonne elicits points determined by how the followers are set. The only feature that doesn't get you points are fields. Roads that cannot be expanded also give you points whether they end or not. Players get the points of a feature if they have the most followers on that feature. If there is a tie, then both players get the full amount of points. Cloisters, which are groups of the same features that have followers, also score any adjacent tiles. Cities are one point per tile and one point per pennant if there are just two tiles. For each tile in addition to the original two, you get two points per tile and two points per pennant. Each road is worth one point for each tile. Cloisters get you one point for the original tile and one point for each tile around it (to a maximum of eight). Fields are worth nothing during the game. However when the game ends, fields get a player three points for each finished city adjacent to the field. So with a field and city, it's possible to rack up points in one little section of the gameboard. In the beginning of the game a player gets seven followers. Saving them for the right time in placement is a key strategy in the game. Most players wait until a nice cluster of possible points clusters on the board before setting down a meeple. It's hard to say how the board will play out early in the game, so that is why many players wait a few turns before placing their followers. Another good strategy is to join cloisters or features that contain one of your followers. If the board stays that way when the scoring occurs, then you will get your points and also any tile points placed from the connection. The fewer players you have, the easier it is to share. This is frowned upon, but players often memorize the number of types of tiles that exist. That way when they get a particular feature that isn't useful for them, they can stop other players from finishing a high point earning section. Inns & Cathedrals (2002) adds new tiles to increase the value of cities and roads, plus a large meeple that counts as two ordinary meeples. Traders & Builders (2003) adds new ways to score points and play extra tiles. The Princess & the Dragon (2005) adds a touch of fantasy, with a dragon figure and secret passages under the city. The Tower (2006) lets players build upwards to strengthen their power and influence. Abbey & Mayor (2007) introduces a variation on cloisters and special pieces that can only be played in cities. The Catapult (2008) adds a dexterity element in the form of a catapult that flings tiles at the board. Bridges Castles and Bazaars (2010) brings traveling peddlars and an auction mechanic into the game. There have also been many "mini" expansions made available as promotional items in magazines. Carcassonne: Hunters and Gatherers (2002) is set in the Stone Age and has slightly different rules. Carcassonne: the Castle (2003) is a two-player version. New World: a Carcassonne Game (2008) is set in America, and asks players to start in the east and build westward. The Kids of Carcassone (2010) is a simplified version for younger players. No matter which version you play, Carcassonne is a fun game that anyone can pick up in a matter of minutes. With the number of expansions and variants that are available, you are sure to enjoy it for years to come.